Letter X week was, in a word, X-cellent! Be sure to read on below to learn about all the learning that took place! 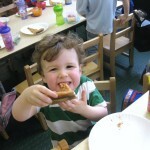 On Monday and Tuesday morning, the students entered the classroom and much to the surprise of the teachers, nearly ALL had xylophones in hand! The colorful instrument was clearly the most popular share of the week. It seemed like EVERYONE at Park Prep plays the xylophone when they are not at school. After the shares had been discussed, the students got right to work on their letter writing/tracing activity sheets. 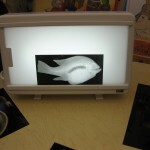 By far the most silly picture of the activity was the picture of the Pristella maxillaris, more commonly known as the X-Ray Fish! 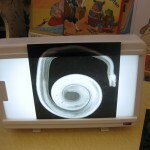 Although the students enjoyed coloring in the cartoon X-Ray fish, it was clear that they much preferred the opportunity to see a close-up of a real X-Ray Fish later on in the day. The fun continued in the afternoons as the students brainstormed all the X words they could think of. Not surprisingly, the X list was a tough one. 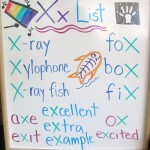 In order to help lengthen it, Miss Jocelyn’s suggestion that the students should “think of words where you hear the X sound inside” led to slightly mispronounced words like X-scalator and X-cape! Eventually the students came up with some really great words like the ones listed below. One of the five year olds even noted that as long as a word rhymed with an x-word, there was a good chance that it would also have an X in it, i.e. box and fox. On Wednesday, the teachers changed the schedule around a bit and decided to discuss Spanish not only in the afternoon but also the morning! 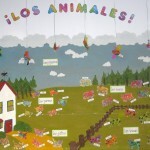 Seeing how much all of the students love learning about Los Animales (animals), the teachers thought this unit would be an eXcellent choice for a Spanish bulletin board! Miss Rima painted a perfect bulletin board backdrop of a farmyard/forest. The only thing left to add was the animals and boy, did the teachers have a great new art material to use! Be sure to watch how the beautiful animals were created. The Spanish fun continued in the afternoon as the students not only reviewed the animal vocabulary- they BECAME it! 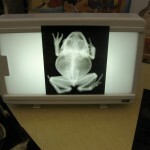 On Thursday, the schedule was back to normal and the students began working on the first X-ray craft of the week! 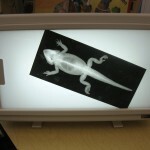 With a little help from Dr. Greenwald, the teachers set up an X-Ray station where students could take turns putting up real animal X-Rays to an X-Ray machine. See if you can figure out the different animals below. Number 7:This is a tricky one. Here’s a hint: It’s not part of the cat family. So, how did you do? Here are the answers. 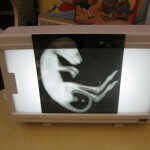 Also on Thursday morning, the students had an opportunity to create their own hand X-Ray. First, the teachers traced the student’s hand on black paper. The teachers quickly cut out the students hand and placed it on some clear contact paper. 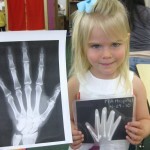 Using Q-tips to replicate bones, the students viewed a real hand X-Ray and place their “bones” accordingly. 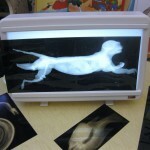 Once the hand had been created, the teachers sealed up the X-Ray with another piece of contact paper. Here’s how they turned out. On Thursday afternoon, the students once again turned Park Prep Academy into the Park Prep Zoo while they transformed into animals. Friday was one of the most exciting days of the year. Friday was the day that the teachers made good on a promise. The promise was made way back in September when the teachers informed the students that when all of the students at school were completely toilet-trained and in underwear, there would be a pizza party lunch at school to celebrate. Well, this Monday was the first day that ALL of the students (on Monday/Wednesday/Friday) were in underwear! 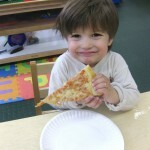 The students simply could not contain their excitement when they realized that the pizza party was finally going to happen! 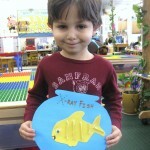 Before the pizza arrived, the students worked on their morning work – creating X-Ray fish! In order to create the bones inside the fish, the students used a special type of noodle called Perciatelli. 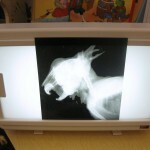 The students had a great time creating these X-Ray fish but it was clear that they had Pizza on the brain! So we had a “All-in-Underwear Pizza Party”. Well, that’s all for letter X week! As always, we hope that you enjoyed reading and we will see you next week for some more learning and fun! P.S. 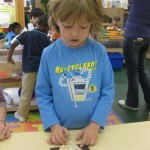 A little follow-up from last week’s discussion about WASTE. The student below did her part in the spirit of Earth Day. While coming back from using the restroom, this student alerted her teachers of a drippy faucet by saying, “One drop makes a lot of waste”. Way to go!